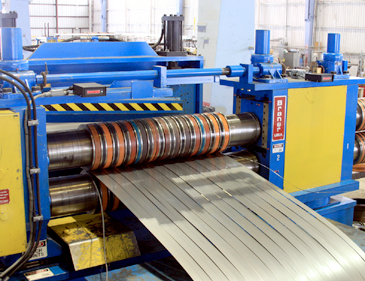 Pasadena, TX - American Strip Steel Toll Processing & Storage, a multi-location carbon steel coil and sheet toll processor, has installed a new high-performance Braner/Loopco Single-Loop Turret Head™ Slitting and Slit Coil Packaging Line in its Pasadena, TX plant just outside of Houston. 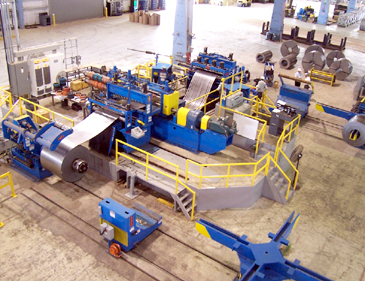 The new 72" x 1/4" Slitter joins three (3) other Braner/Loopco Turret Head™ Slitting Lines in operation at American Strip Steel plants. 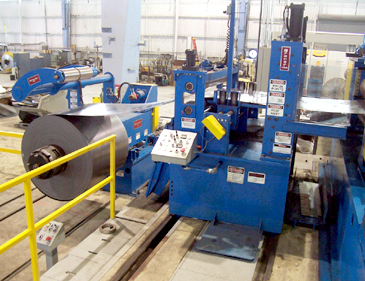 American Strip's latest high-performance slitting line processes 60,000# x 72" hot rolled, cold rolled, and galvanized coils at speeds to 1,000 FPM. Coil gauge capacity is from .015" through .250". Single-Loop or either of two (2) Tight-Line slitting modes can be employed for processing a wide range of gauges and mechanical properties. 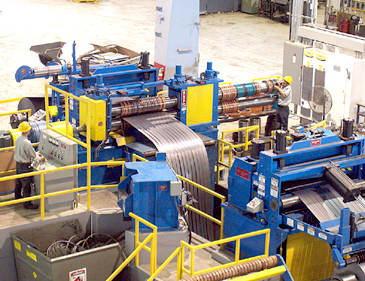 Quick coil threading, superior strip tracking, elimination of equipment induced coil-breaks, and excellent operator sight lines are among the many benefits of the compact high pass line equipment arrangement. Entry and Exit Turnstiles, Entry and Exit Shears, laser beam coil alignment, fiber optic automatic servo edge guiding, plus many other performance features enhance American Strip's ability to efficiently process small and large orders throughout a gauge range from .015" through 1/4". The quick-change precision Turret Head™ Slitter produces close-toleratnce slit strips with minimum burr throughout the entire range of gauge and mechanical properties. The unique, unobstructed open-arbor Turret Head™ Slitter design speeds re-tooling and accomplishes a head change cycle in one-minute. Reliability is bullet-proof. American Strip's Turret Head™ Slitter is equipped with two (2) 10" x 72" slitter heads supported in massive precision machined solid steel bearing housings. Arbor shoulder runout at .000020" TIR produces precise width strip with minimal burr. The Turret rotates on a precision ring bearing, which assures precise arbor alignment and effortless head change in one-minute. The slitter head at the "re-tooling" station is designed to minimize set-up time. The head is open and accessible with no housings, bases, or structures that would obstruct tooling removal and installation. Free and clear access and quick-change ability allow Turret Head™ users the ability to make more set-ups and head changes per shift than with any other multi-head slitter or tooling transfer design. Turret Head™ slitters are fitted with multiple integral slitter heads that do not require removal from a base or uncoupling from a drive in order to exchange heads. The integral multi-head design makes Turret Head™ Slitters more rigid, more precise, and more reliable than any other slitter or tooling transfer design.